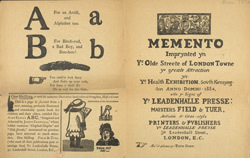 This leaflet promotes a new illustrated children’s book by Joseph Crawhall. The years from 1860 to 1920 are often known as the Golden Era of children’s literature. Before this time most books for children focussed on intellectual or moral instruction, but changes in the social conception of childhood generally, and a vogue for elaborate illustrations, produced a new literature aimed more at their entertainment.